"I had to explain to the airport staff what they were going to find inside," Mr Vlassis told the BBC. After a long journey, he arrived on the island and buried the remains in a private grave in his village. Finally, his father had a permanent resting place. Mr Vlassis's story is not an unusual one in Greece. Burial in the country's largest cities has long been a temporary measure. A shortage of land means cemeteries in Athens and Thessaloniki are overcrowded. There are no crematoria in Greece, so grave space has to be recycled. Authorities rent out plots, and a typical lease lasts three years. When that period has passed, families are recalled to the graveside to witness the removal of the body from the ground. Although grave rental is not entirely uncommon in Europe, Greece's approach is unique. Relatives can pay to place the bones in a communal storage area known as an ossuary. Others choose to take them to a regional cemetery for reburial, as there is often more space. If no family member is present at the exhumation, the bones are dug up, dissolved in chemicals and the remnants placed in a common burial plot. Mr Vlassis sent a representative to oversee the process for him. What unfolded was an experience familiar to many Greeks. "The body had not dissolved. Can you imagine? It was very upsetting," he said. "So they said they were going to bury him again in a light layer of earth. When I went back months later the body had decomposed. "They then put the bones into a plastic box. My own father, in a box." 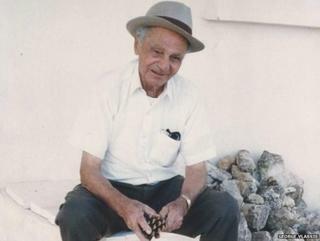 Mr Vlassis said his father would have preferred cremation, with his ashes scattered at sea. However, Greece is the only mainland country in the European Union without cremation facilities. Although the practice was legalised in 2006, attempts to build a crematorium have stalled because of objections from local municipalities and the Greek Orthodox Church. The Church views cremation as a violation of the human body and forbids its members from reducing their bodies to ash. It means those baptised into the Orthodox faith must diverge from its teachings and travel abroad to cremate their loved ones. Antony Alakiotis set up the Committee for Cremation in Greece after witnessing his own father's exhumation at the age of 14 and has led a campaign against the country's strict burial regulations. "For a young person to lose your father and then have to go through this is a very bad experience," he said, speaking from his home in Athens. "I am 60 now, but that is still the way things are done. You remember it." Mr Alakiotis believes cremation would not only alleviate overcrowding in graveyards, it would also reduce financial pressures on families. "It would be a cheaper option for people. To pay for a grave for three years is around €2,500-3,000. Cremation would be half that." The BBC approached the Greek Orthodox Church for a comment, but it has not received a response. The Mayor of Thessaloniki, Yiannis Boutaris, is also keen to see an alternative to the "unpleasant and inhumane" rental system. Last year he successfully petitioned the environment minister to amend legislation and remove restrictions over where crematoria could be built. "The latest version of the law makes it possible for crematoria to be built outside graveyards, paving the way for their creation. "We're looking for the suitable plot of land and, of course, we're looking for ways to finance the whole project." The Church's governing Holy Synod condemned the change in the law as an attempt "to remove faith from every aspect of life". Priests have been instructed not to conduct funeral ceremonies for anyone opting for cremation. However, Mr Boutaris is determined to press ahead with his plans and says Thessaloniki will have a fully functioning crematorium by 2016. The mayor lost his own mother earlier this year and decided to cremate her abroad. He sees the construction of a crematorium as a democratic issue as much as a practical one. "At stake is the freedom of disposing your body," he said. "A choice, a freedom, similar to donating your organs."